After a storm of controversy, UC Riverside officials have thrown out their proposed “protest guidelines,” which included a long list of administrative approvals students or staff were required to get before holding any campus protest. Over 900 people had signed a petition expressing their outrage at UCR’s attempt to limit students’ and workers’ constitutional rights to freedom of speech and assembly. At a hearing this week in Sacramento, state legislators said they were disturbed over the recent UC Davis police pepper-spraying of demonstrators, as well as UC Berkeley and California State University police wielding batons against protestors. “Something is wrong with a system where our children and students, struggling peacefully to have their voices heard, are answered by the spray of chemical weapons and the sting of a baton,” said state Sen. Alan Lowenthal (D-Long Beach). UC officials apologized and said they were investigating changes in policy. 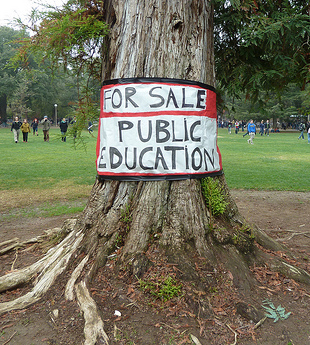 Debt, Democracy and the Public University is the title of a just-transcribed talk by UC Santa Cruz professor Bob Meister, who appeared at UC Berkeley on December 7. He has previously written about the finances behind UC’s skyrocketing tuition in They Pledged Your Tuition to Wall Street. Senator Leland Yee (D-San Francisco) has announced pending legislation that would require electronic public information to be user-friendly and searchable using common computer tools. Among the many agencies that would be affected is the University of California, which routinely issues data on public information such as salaries, positions and policies in very un-user-friendly formats. There’s a nationwide campaign to call House Speaker John Boehner (R-Ohio) at 202-225-0600 and tell him to approve the bill. You can also call or write your congressperson (look up your district here). The Monday Memo collective will be taking a break until January 16. We challenge you to join us in starting out the New Year by reaching out to three of your UC administrative professional coworkers, and asking them to sign and mail this UPTE authorization card for union representation. If you need locations of APs near you, just let us know!